For over a year now, Facebook users have been periodically plagued with scam offers for a free MacBook Air. The pitch starts with a Facebook message from a friend of yours (aka victim) who recommends the "OK guys my friend's company is doing a promotion and offering free Apple macbook air's. This hasn't been released to everyone yet but I'm sending it out to you guys to get a chance to get them first" and sends you a link to a Facebook Wall. The perpetrators are onlinerewardsclub.com and can be flamed by sending roadkill to this address. Read the fine print, however, and you'll discover the MacBook Air 'giveaway' scam requires you to qualify in two ways each for each of three separate tier programs. The net result is that you pay more for required incentive merchandise than the MacBook Air is even worth. Then, assuming you've spent that much and actually qualified, you have to jump through a bunch of other hoops in order to claim "the prize". Any mistake or omission along the way, and your out all the cash with no Macbook Air to show for it. This type of scam dates back well before the days of the Internet, when scammers sent enticing offers in snail mail that required similar jumping through hoops in an attempt to win merchandise that proves near impossible to obtain. But while the scam itself is old, it continues to give new meaning to the phrase "a fool and his money are soon parted". Part of the added way people can earn points for one of the tiers is by recommending their friends for the program - which is how new victims are enticed into the program. After all, it's a recommendation from a friend - though in reality, a friend that has themselves been hooked by the scam. Though the scam is misleading and costly, it manages to stay slightly on this shade of legal probably because terms and conditions are provided upfront for those who bother to read such things (and many don't, but everyone should!). 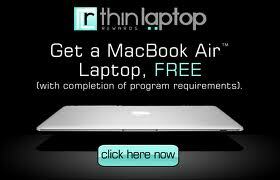 Also common on Facebook are ads to get a free MacBook Air claiming that the company is seeking laptop testers. The ads lead to an incentive marketing program at onlinerewardsclub.com where participants must sign up for various products and services in order to earn their free laptop. The Fine Print: Customers must complete two options from each of the three tiers, Top, Prime and Premium before receiving their "free" MacBook. Example offers listed in the Top and Prime tiers include signing up for credit cards or trial offers for subscription services such as for vitamin supplements or DVD rental services. In some cases, the participant will need to pay for shipping, and if they aren't vigilant about canceling the trial offers they signed up for, they'll begin being billed every month. You are responsible for all local, state, and federal taxes on any gifts you receive. Onlinerewardsclub.com requires that anyone receiving gifts valued at $600.00 and above in any calendar year complete and submit a W-9 form from the Internal Revenue Service in order to allow Onlinerewardsclub.com to comply with IRS reporting requirements. Examples of the Premium offers listed on the Web site that must be met in order to get the MacBook are much more expensive and include paying as much as $1,500 for furniture, credit cards with high interest rates or purchasing a travel package with a minimum value of $899.00 per person. BBB Warns: Incentive programs can be extremely costly in the long run and the fine print shows that the customer might have to pay a significant amount of money in order to get their "Free" items. It is also a red flag that Apple does not even make MacBook Air in purple, red, pink, or green.